4 Bedroom Detached House For Sale in Alloa for Offers Over £225,000. 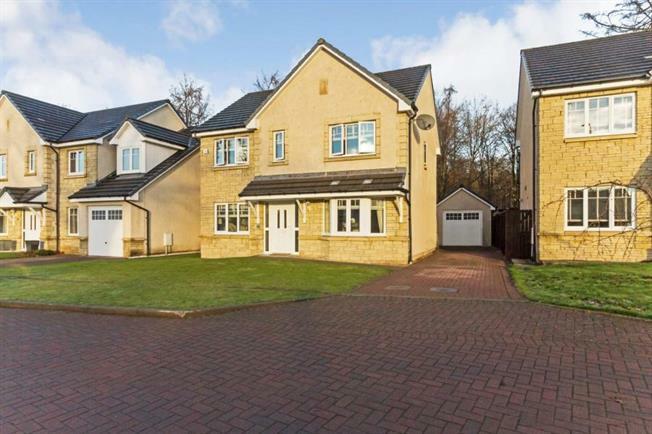 UNDER OFFER A superb four bedroom executive detached villa within the desirable Alloa Park estate. Taran is ideally situated within the popular town of Alloa and benefits from range of amenities including: retail, restaurants, supermarkets, schooling including primary and secondary levels and leisure activities. Internally this impressive home comprises, reception hall, front aspect lounge with bay window, an open-plan kitchen/family room, formal dining room, utility room and WC on the ground floor. The upper level features a master bedroom with en-suite and fitted wardrobes, three further bedrooms with two benefitting from fitted storage and is completed by the family bathroom. Gas central heating and double glazing is installed. Externally the property enjoys well-established garden grounds, with the rear garden enjoying a wooded aspect and boasting a generous paved patio area, central section of lawn, timber shed and side access to the detached garage. A driveway to the side provides further off-street parking. Please refer to Home Report for EER Band.